"Honestly one of the most exciting books I've read, because [Goldrick-Rab has] solutions. It's a manual that I'd recommend to anyone out there, if you're a parent, if you're a teacher, if you're a student." "Bracing and well-argued, this study not only puts faces on the students who struggle to earn college degrees; it also serves as a warning that university study is rapidly becoming a privilege reserved for only the wealthy. Necessary reading for anyone concerned about the fate of American higher education." "What if we rebuilt the financial aid system around the ways that students actually live? Sara Goldrick-Rab takes an admirable shot in Paying the Price. . . . As a contribution to our understanding of financial aid and its impact on low-income students, it's remarkably useful. . . . Goldrick-Rab's significant contribution here is building policy around actual students. It's easy to postulate how an ideal student should behave, or to build a policy on the assumption that every student is 18 years old, attending full-time, living on campus, and receiving ample family support. It's much harder to build policy on the complicated lives that actual students actually live. It's to her credit that Goldrick-Rab goes into the weeds. Here’s hoping that people who control state appropriations hear her." "A detailed look at shortsighted and insufficient policies and the specific havoc they wreak on specific students." "Ultimately, though, Goldrick-Rab argues that we need a new system, 'a Financial Aid 2.0 that is based on accessible and affordable high-quality public higher education.' Rather than offering more financial aid to keep up with rising prices, this future system would make the first few years of college, or the initial degree, free. Tennessee already offers tuition-free community college to all, and other states are considering similar programs, so this final recommendation provides a glimmer of hope that investing in our own young people is something a divided nation might eventually agree on. Paying the Price is an invaluable resource, chock-full of data and empathy, to bring to that effort." "Goldrick-Rab's important book should be read by policymakers, students, and parents. She explains clearly how access to college has been narrowed by rising costs, how elected officials have dodged their responsibility to maintain access, and what we must do to save the American Dream--the promise that all have equal opportunity to succeed." "Paying the Price is an urgent and necessary text. 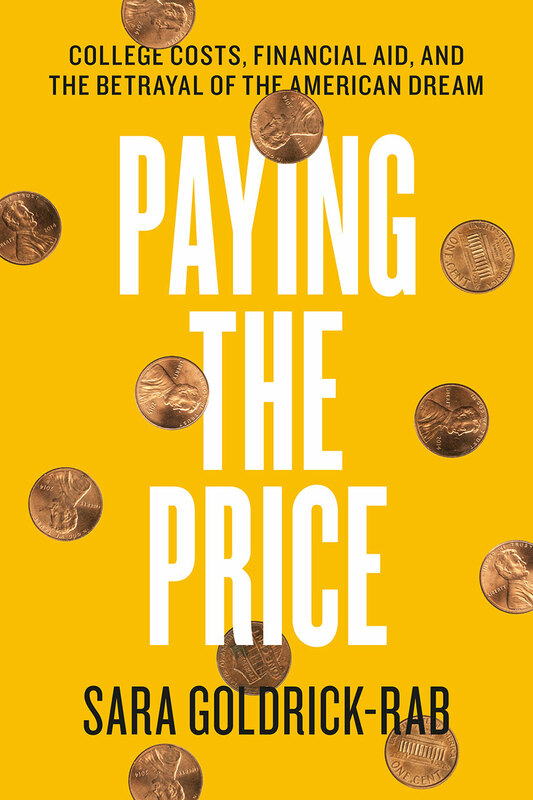 Through rigorous research and careful analysis, Sara Goldrick-Rab shows how the American Dream is structurally compromised by the exorbitant costs of higher education and a thoroughly dysfunctional financial aid system. With texture and subtlety, Goldrick-Rab spotlights the journeys of students whose road to educational access and social mobility is obstructed by the current crisis. Equally important, she offers a practical and progressive action plan for creating a more fair and just system." "Goldrick-Rab's narrative puts a face to the national higher education cost crisis. The students she profiles through her research represent thousands of individuals who pursue a degree in pursuit of social mobility and the American Dream, only to find themselves unable to make ends meet and often drowning in debt. By personalizing our country’s failed higher education policies, this book takes readers beyond national headlines and statistics and into individual lives. Goldrick-Rab's scholarship fills a critical void in our conversations about the realities of financial aid policy in the face of rapidly rising tuition and important poignant reminder of the ongoing negative impact of state appropriation reductions in this era."